"It makes sense to build your life around love!" Add L.O.V.E. to all your relationships! APPLY THIS FORMULA AT ♥ WORK ♥ HOME ♥ SCHOOL ♥ COMMUNITY ♥ WITH YOURSELF ♥ IN WORSHIP ♥ ANYWHERE! Do you have a special relationship you are wanting to "build or improve"? Is a relationship “stuck” or going “sour”? Do you need to "resolve conflicts" with those around you? Are you "uncertain" as to how to make improvements? First - For any relationship, ask yourself the four L.O.V.E. questions to get your relationships back-on-track. Second - Be proactive! Choose to keep all your relationships “centered in love” - all the time (24-7)! Third - Use your fingers as VISUAL REMINDERS anytime you want to use the L.O.V.E. Formula steps. For Applying the L.O.V.E. Formula to your life! 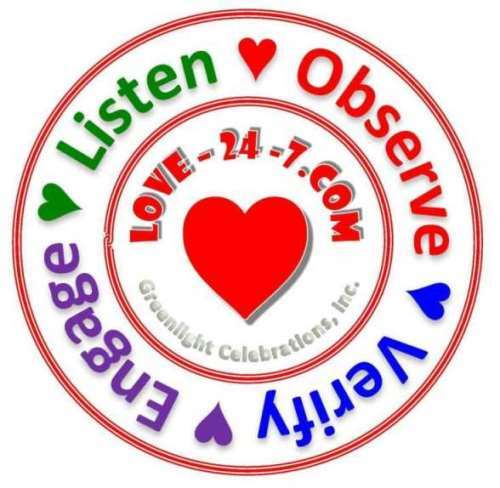 ♥ Use these FOUR (4) Application TIPS to help you "focus your attention" on key L.O.V.E. Formula steps. Learn to "intentionally" focus your life on "loving yourself and others".